So you decided to create the island that would form the setting for the game based on Miyamoto-san’s “Island Concept”. What happened next? I believe the “Island Concept” was finalised in early April, 2008 and there are notes from that period stating: “We’ll show it at E37." 7 E3 is the Electronic Entertainment Expo held in Los Angeles annually at which video games companies unveil new products and titles. 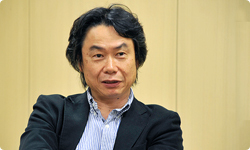 Was it Miyamoto-san who said: “We’ll show it at E3”? In 2008, E3 was held in July, wasn’t it? This means he was asking you to get it ready to unveil at E3 which was a mere three months later. Miyamoto-san certainly comes out with some amazing things, doesn’t he? Although the software doesn’t exist in any shape or form, he’s setting you the task of getting it ready for E3 in the space of three months. Well, I judged that the team had the capacity to pull it off. 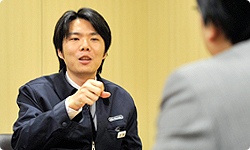 Moreover, as Shimamura-san mentioned briefly earlier, the idea for Wii Sports 2 had already been included in the original plan for the software to develop for Wii. For the original Wii Sports, you experimented with all kinds of things and the plan was to use those ideas which you couldn't bring fully to fruition at that point for Wii Sports 2. So it wasn’t as if we were starting from zero. That’s true. We weren’t starting from zero. At that point, we were discussing the idea of having a game featuring winter sports and marine sports. We had already decided that we would use an island as the setting for the game, so we thought of all kinds of marine sports and sports suitable for a tropical island. We selected three of those ideas to unveil at E3. …And Power Cruising. But in fact we actually had a fourth one as well. Why did you decide not to unveil archery? At that stage, we weren’t sure whether or not we could actually successfully recreate sports like archery. the Wii Remote represents the bow, which you hold in your left hand, while you pull the Nunchuk all the way back with the right hand . We created a test version but as it is a sport that demands extremely slow movements, we didn’t yet know whether or not we would actually be able to make it work. So you mean that, at that point, Wii MotionPlus was able to detect rapid movements, but it still wasn't clear whether it would be able to pick up slow movements. 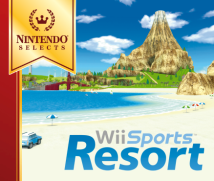 Because the development of Wii Sports Resort and the Wii MotionPlus hardware took place at the same time, there were cases where we went ahead and developed something without yet being certain about whether it could be successfully realised. Are there other examples of that besides archery? It was also the case with swordplay. We originally decided to make swordplay as we thought it would be well suited to Wii MotionPlus, given that the position the player holds the Wii Remote in would correspond to the position of the sword on-screen. If you repeatedly waved the Wii Remote, it would gradually become out of synch. So you experienced “temperature drift”. 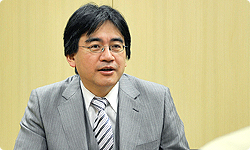 This was something I learned about in the last Iwata Asks interview when we discussed Wii MotionPlus. The point which is calculated as zero can shift due to changes in temperature or humidity. That’s right. If you played the game for a while, the angle that the player was holding the Wii Remote and the angle of the on-screen sword would drift out of synch. No matter what we did, we were unable to resolve this issue and thought that we wouldn’t be able to make the game. It was at that point that we all discussed it together and decided that we would attempt a game in which you only swing the sword once. Can you really make a game in which you only get to swing the sword once? The idea was to have a game where you and your opponent face each other and strike with your swords only once. The player struck by the sword would lose. I expect you remember the title WarioWare: Twisted!8 That game also utilised a gyro sensor, but as expected, the point representing zero would drift out of place. 8 WarioWare: Twisted! was released in Japan in October 2004 for Game Boy Advance. It was an action game where the player had to use split-second reactions to twist the Game Boy at the right moment. How did they manage to resolve that issue? Using the supplementary technology that Ota-san devised, we were able to get rid of this problem of drift. He solved it in a way that you just wouldn’t imagine, so I wondered what sort of magic he’d used. As you’re waving the Wii Remote, it steadily corrects itself. Normally, you’d expect it to drift further away from the correct point as you wave it. But in fact, it becomes more and more accurate. The more you wave it, the more accurate it gets! In addition to that, thanks to technology developed by Sato-san and some tweaking of the rules of the game, in the final version, you can even take on 70 opponents in a sword fight. So you started off with just a single opponent - and with only a single blow to defeat them - yet it grew to 70 opponents! Well, the original plan states that the aim is to let players do battle with 1000 opponents. Right. We thought that the more opponents we had, the better! (laughs) But taking on 1000 opponents in a sword fight just isn't feasible, no matter how you slice it!